And as the story goes, Waylon Jennings gave up his seat to the "Big Bopper" on that fateful night . He sure did, and it affected him for a long time after that. The Big Bopper had a cold or flu and it was thought he might get even sicker on the crappy bus they had all been traveling on (and a drummer got hospitalized with frostbite from the lack of heat on)... doing him a favor. Such a pointless waste of three talents (BB/J.P. Richardson wrote White Lightning and Little Bear Loves Little White Dove which were hits for other performers, and of course wrote and performed the hit Chantily Lace). It's a bit time-wimey. 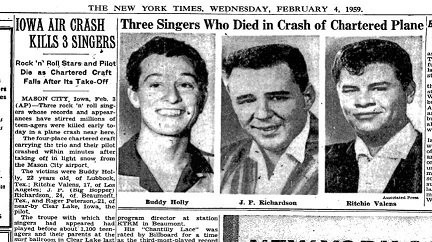 Buddy Holly was 22 and he and the Crickets had their first hit less than 2 years before he died. But with rock and roll being such a young genre at the time, that was not just a relatively significant span of time, it was almost all-encompassing. An artist with less than 2 years' worth of hits dying tragically today would register coverage, but it wouldn't resonate throughout the history of popular music in the way that Holly's death did. And yes, what a waste. It's not difficult to imagine Holly writing popular and influential songs for decades and decades had he lived that long. My Dad was buying records back then and had Ritchie Valen's LP and one Buddy Holly on Decca while they were still around. I played Ritchie's a lot, there were many solid tracks on it. An amazing fender player (as was Buddy) so even instrumentals would've been worth hearing (and I think Del-Fi did eventually release a couple of incomplete recordings that were just the backing music/lead guitar before vocals). The Fireballs group completed some of Buddy's demos and I think they sounded great, some of his last songs written are among his best, and were hits in England at least. Ritchie played in Vancouver and stayed an extra week with some people there because of weather issues, they were very sad when not so long after the weather took his life. The weirdest thing is at the crash site he and Buddy looked like they were sleeping, not a mark on them really, same with Otis Redding. I wasn't even alive in 1959 but seeing some of the photos was still traumatic, I wouldn't recommend it, I can't get them out of my head. I hope their music remains popular and alive forever.